There is a large number of pipe plugging and blocking requirements within a variety of industries, such as oil and gas, construction, plumbing, shipbuilding, mining, power etc., for duties such as repair work, leak testing, weld purging and debris stopping. One major concern being the entry of debris into pipes during operations. The Pipestoppers® division at Huntingdon Fusion Techniques HFT® design and manufacture a range of mechanical and inflatable pipestoppers and plugs to suit all applications. The low profile stopper is available for applications where insufficient length of pipe is available for the regular cylindrical or spherical stopper. Ron Sewell, Chairman at HFT, said: “The low profile stopper can fit into a pipe end that may be directly on an elbow or just inside a flanged neck on a casting. Other applications include blocking pipe ends to keep gases inside or to keep debris and vermin out. Manufactured from tough, robust fabric, these new low profile stoppers are available in sizes 6 - 88 in. (150 - 2235 mm) and provide excellent grip inside the pipe, with an effective airtight seal. Each low profile stopper is fitted with a standard schrader valve connected to a 1.2 m hose, is easy to inflate using a foot pump or compressor and is heat resistant up to 90ºC (194ºF). Cylindrical and spherical stoppers: an easy way to stop the flow of gas or liquid inside pipes and ducts. Available up to 96 in. dia. (2440 mm). 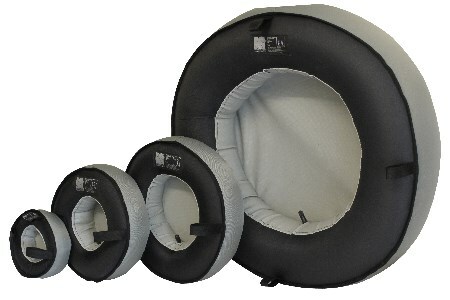 For higher temperatures, these inflatable stoppers can also be manufactured with a heat resistant cover for temperatures up to 300ºC (572ºF). PetroChem® stoppers: manufactured from high grade latex, they are used for stopping off pipes with hydrocarbon gases and liquids inside. Inflatable rubber plugs: a wide diameter range and are tough, durable, can withstand chemicals and hydrocarbons, for higher pressure applications, with a long life. The Pipestopper division manufactures a range of mechanical stoppers and plugs for industrial and domestic plumbing operations, water drainage systems, as well as offshore operations. These mechanical stoppers are negatively buoyant for subsea work and can be used in all kinds of pipes and other vessels where there are orifices to be sealed or blocked. The division also provide pipe freezing systems that make ice plugs inside pipes, to stop the flow of liquids so that maintenance can be carried out on valves, etc. This technique avoids the draining of a complete pipe system that might have an expensive product inside, ranging from heated water to expensive petrochemical fluids. Freezing can be carried out remotely, which is excellent for nuclear service personnel.